Today I have a fun card with a cute little Penny Black image that I've had in my stamped images box for ages. I used some strips of Echo Park Country Drive dsp to make the herringbone background, and then embossed the entire thing with a CB decorative tiles ef. I colored the image with Copics, adding some glossy accents to the pink boot the hedgie is sitting in. I added some Punch-a-Bunch butterflies along with some negative do-dads from a border die cut, and put them up in the sky for that wee hedgie to look at. I die cut the image panel with a Lil Inker stitched rectangles die. I'm also entering this into the MFP Speedy Fox & Friends challenge #261 - to use strips of paper at an angle. Wishing you all a wonderful weekend, and thanks for stopping by! Love how you made the boot like shiny vinyl! Gorgeous background, Carol! This use of paper strips looks great, Carol!! I didn't know the name of this technique (the "herringbone" background) but I have seen it in another your card and I think it's fabulous with the embossing!! So movimented and pretty texturizing! The cute hedgie seems really look at the lovely butterflies! This card is so spring and happy! Beautiful background and of course you can't beat a hedgie and when he is sitting in a boot you have total cuteness. Have a wonderuful weekend. Cute image and love the embossing over the herringbone in the background! Very, very cute card! Another fabulous background you've made here Carol. I love the cute little hedgie in the pink boot too. Great Card Carol. 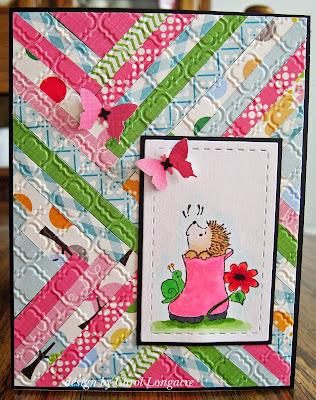 I love how you embossed the card after creating your herringbone background. Thank you for joining us at MFP Speedy Fox & Friends. Your are the Queen of Herringbone...Always enjoy seeing your pretty creations using that technique for your background! Your image is so cute too. Beautiful background and adorable image and card. Thank you for sharing with us at MFP Speedy Fox and Friends Challenge. 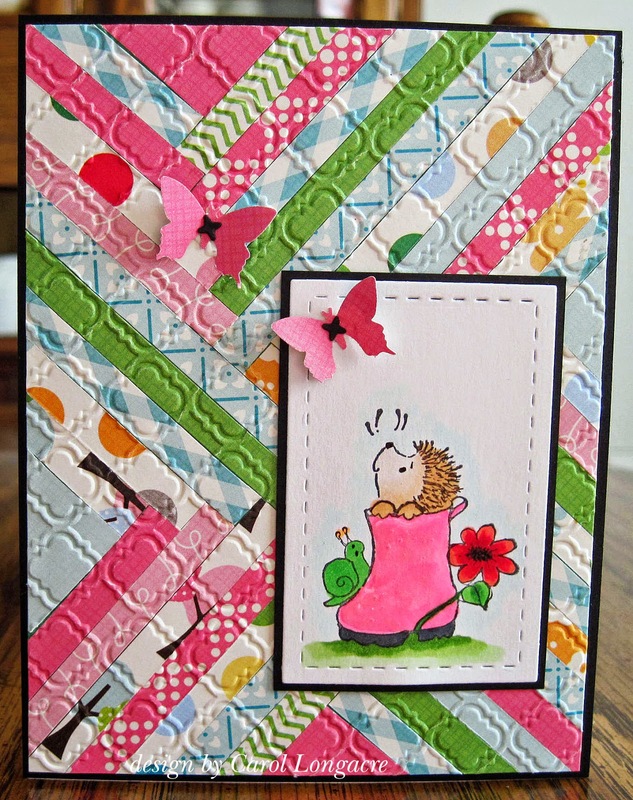 A fabulous card Carol, such a cute image and lovely colourful background. Such happy colors!!!! You are rocking the box of images. I've made a decision... I'm setting mine on fire. LOL! I'd better not... might burn the whole house down on accident. Love the background you made and great job on using your stash of images. The little heggie is adorable. I so want to see one in real life. Thanks so much for sharing with us on MFP's Speedy Fox and Friends. How adorable!!! Your colors and strips are perfect! Thanks for sharing with us at MFP Speedy Fox & Friends. Such a darling card, Carol. Love the herringbone background and that image is just too cute! Awww...sweet card! Love your paper background!